Built by Bouygues Architects. Opened 2005. Originally named in honour of the Turkmen dictator, Saparmurat Nyýazow (1940-2006), self-styled "Türkmenbashy" (Leader of Turkmen). Later renamed "Türkmenistanyn Bas Drama Teatry" (Turkmen Main Drama Theatre). Reverse Text: "Türkmenistanyn Bayik Saparmyrat Türkmenbasy adyndaky bas drama teatr. 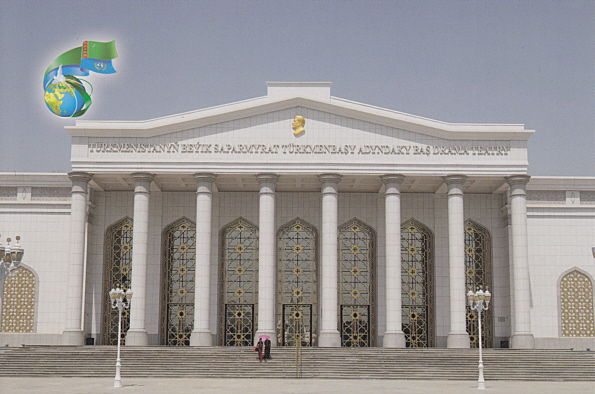 Turkmen Drama Theatre named after Saparmurat Turkmenbashy the Great. Turkmensky dramatichesky teatr im. Saparmurata Turkmenbashi Velkovo"